How to use roof coating? This one is the best roof coating which is produced by adding solvents and catalyst to a silicone base. Silicone is natural and so silicone coating is biodegradable making it environment friendly and safe to use. Different techniques are there to apply silicone coating over the roof including rolling and spraying. As you can choose one of these according to your convenience, they also give you colour options i.e. translucent and reflective white. While rolling the silicone coating, use a medium nap roller and it can be applied easily. The coverage area is somewhere around 1000 square feet per 2 to 3 gallons. Silicone coating is resistant to pond water for a longer duration and also it delivers quality and effectiveness to the roof. This type of coating consists of asphalt particles dispersed in water and it uses clay as the emulsifying component. It also contains organic and inorganic fibres and fillers which further lends extra protection to the coating. You can buy it in brown, black or reflective coating when aluminium pigment is added. The coverage is almost 100 square feet per 1.5 gallons so you don’t need to buy a lot of quantity. The application is quite easy which is why it is one of the best sellers. Consisting of acrylic polymer, this roof coating is well known to provide durability and extend the coating life. Usually, it is used as white reflective coating given the fact that it is available in a number of colours. Its low cost and durability feature makes it the right choice for contractors and facility managers. To apply it, two coats are required and the coverage it offers is 100 square feet per 1 gallon. For application, roller or spray technique is used and it has to be recoated within 2-3 years of first application. Elastomeric roof coating is the easiest coating but it needs care and attention to apply this. To coat a typical roof, you have to have some skills which will reduce risky applications. As application takes time when you are working in warm environment, it is essential to have patience to get things done right. Make sure to wear right gears to protect eyes and skin. To apply coating, you should have enough power, strength and safe equipment. If you want to make things easy, pour the coating in a small container and avoid holding the original big tin. Examining the roof membrane is the very first step of the roof coating. Check if the roof has tears, cracks or blisters, open seams or exposed foam. If this is the first time, then it’s fine but if it is already coated, you need to examine the condition of the previous coating. 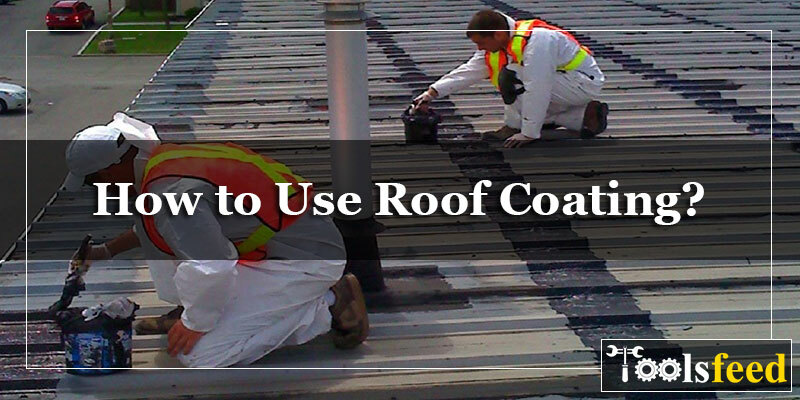 To apply the new coating, roof should be in good condition without any type of cracks. Also, the coatings are not able to save dried out and worn out roofs as well as weak roofs are not supported by coatings. To determine the coverage area that your chosen coating will cover, measure the length and width and measure the size in square feet. Gather all the necessary materials, equipment and tools beforehand because it would really be annoying going out to buy things when you have already started with the roof coating. The coating doesn’t take much time and can be completed over a weekend in warm weather. It is suggested to avoid coating in very cold nights as frost and dew can create a problem. Also, if you see any moisture on the surface, do not apply the coat. Once when you are done with one coat, give it some time to cure and then apply the next coat if required. If you are coating in hot weather, start as early as possible because when temperature goes high, the coat gets dry soon which should be avoided. Clean the surface thoroughly: As roofs tend to attract dust, dirt, debris, chimney oil, asphalt oil etc. it is important to clean the surface properly. With this, the coating will stick well to the surface providing a good grip. Buy some solution and mix in a bucket of water to clean the surface using a broom. Quickly clean the surface after washing with water not to let it dry on walls, windows or any other visible surface. Repair the cracks, open seams and seal roof penetrations: Now use a crack and join sealant to repair the cracks. As in the previous coating, there might be some blisters which make it important to fix them in order to have smooth new coating. Build flashings around roof edges using a polyester fabric as it will stretch with the coatings. The fabric is extended three inches beyond the repaired area and then the coating is applied to the roof surface. The fabric is pushed into the wet surface and one more coat is applied over the fabric. Then the patch is left to dry to fill the cracks, cover the seams and roof penetrations. Lastly, apply the coating when the roof is completely dry and the sealant used in the previous step has set. To apply coating, you need a roller for dipping in the coat and go for basecoat and emulsion. There are some areas which cannot be coated with a roller and to fill those areas, use a brush. Always apply the thick topcoat or two thin coats to achieve great results. While applying the coat, never over roll the roller as it will leave marks on the surface. Simply dip the roll and spread on the roof. For added protection, you should apply additional coats but let one coat dry before applying another. One coat a day is suggested in cold weather whereas two coats a day can be done in summers. Whatever you do, keep a check on the weather. To get maximum benefits when it comes to durability and leak resistance, it is suggested doing two coats on the problem areas like seams, cracks, scuppers and drain areas etc. Store the unused material for future fixes.